Most Escalante area slots are far from paved highways and require some determination to reach; one of the few exceptions is found at the south side of the river about half way between Escalante town and the UT 12 road crossing, accessed by a 1.6 mile drive along a dirt track then a one mile hike. The drainage is unnamed on topographic maps but known as Micro Death Hollow on account of its proximity to Death Hollow, which joins the Escalante from the north, a mile upstream. 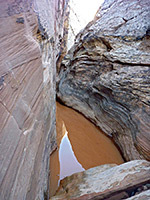 The slot occupies the lower end of a U-shaped slickrock bowl, and although short (1,000 feet), the canyon is very narrow, progressing from a sandy floored ravine with pools and nicely colored rock, to a dark, enclosed, twisting passageway just one foot across in places. Dryfalls at the lower end prevent walking all the way into the much larger canyon of the Escalante River, though this can be reached by scrambling down the slickrock slopes a little way west, hence the slot is often visited as part of longer trips, either up or down the river, or to Death Hollow. The dirt track used to reach the slot canyon leaves UT 12 between mileposts 67 and 66, crossing flat, sandy land for 1.6 miles to a parking/camping spot on a rocky area at the rim of the ravine, from where huge white sandstone cliffs and domes are visible ahead, enclosing the Escalante River. The track is liable to be rutted, and may be impassable after wet weather. The slot is then reached by a 20 minute walk along the west rim of the ravine, in and out of a minor side drainage then along benches to a promontory above the river and the lower part of the slot, followed by a relatively easy walk down steeply-sloping ground to a sandy part of the drainage, just below the narrows. 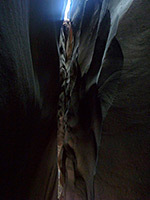 Hands are required in a just few places, to aid the descent, which is completed via a short gully down the enclosing canyon walls, generally sheer and 10 to 20 feet high. 15 views of the canyon; gallery, slideshow. Topographic map of the canyon, and of lower Death Hollow. To the north, the canyon forms a shallow, curving slot of waterlogged, interconnected potholes, soon dropping off steeply to the river. 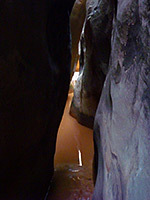 In the other direction, a sandy channel a few feet wide extends a little way upstream, between cliffs of grey-white sandstone, as far as a pool beneath a chokestone. Above here the canyon narrows to around 2 feet across and has some pretty passages likely to contain more shallow, muddy pools, as the enclosing walls come steadily closer together. 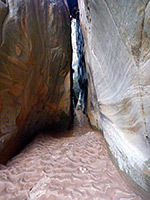 The sandstone is now darker, reddish-black in color; the passage narrows further and the curvy rocks overhang above, so the slot becomes rather gloomy, and very twisting - often it is possible to see just a few feet ahead. In many places the floor is bare rock, narrowing to a point, and easy progress is halted after a while by an upwards-slanting drop of a few feet, above which the canyon is shallower, and the slot ends not far beyond.